There are many different platforms available to advertisers looking to take advantage of Display Advertising including Criteo, Ad Roll and Google itself. In this post, I am going to explain 9 different reasons why you should be taking advantage of Display Advertising and including it within your overall marketing strategy. Just going off the Google Display Network alone, it reaches approximately 92% of all internet users. 65% of those users are reached daily. The Google Display Network is the largest global display network with over 2+ million sites with more than a trillion impressions served to over 1 billion users every month. These are very significant statistics that should remain at the forefront of your mind when you are thinking about whether or not display advertising is right for you. There are various ways that you can target potential customers using display advertising and Contextual targeting is just one of them. Using Contextual targeting in your campaigns, your adverts will be down to individuals based on their search query and browsing history. You specify the type of searches you want your ads to appear for in the same way as you would with standard paid search advertising; include keywords and phrases relevant to your brand or offering. The network will then place your adverts on sites that are relevant to those keywords matching your ads contextually to each phrase. Rather than just sticking with the plain text ads that you see in the normal search results, you can get extreamly creative with your adverts drawing peoples attention to your offering. Have a look at some of the adverts below. You can see how much they would attract your eye if you were on a website and also had a need or requirement for what the ads were promoting. Display advertising can be really cheap if you are trying to increase peoples awareness of your brand. Select the right pricing model (I would recommend CPC) and create the right adverts and you can get your brand seen by thousands of potential new customers. If you are using the Google Display Network, their technology ensures that your ads do not appear next to any undesirable content but I would always recommend that you go to the Site Category Options tab in AdWords to specifically exclude your ads from the types of sites you may not want your brand to be associated with. Using display advertising, you can place your adverts on some very high profile websites for very little cost. 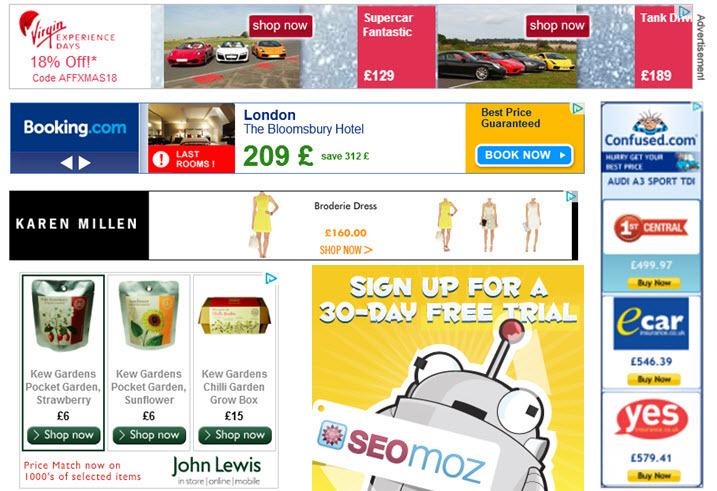 Sites such as Expedia, The Train Line and The Independent all show adverts on their site. If you are being associated with these sites it can give the impression that you are investing a lot in your advertising campaigns when it could actually be costing you a lot less than you think. In the same way as you can opt for Contextual targeting in your campaigns, you can also specify the sites that you want to appear on. These are called placements. If you are using Contextual targeting, you can continuously review what sites Google are showing your ads on and any that you like you can pull them into their own managed placement campaign so you can closely monitor and refine for the highly targeted sites. You can choose between Cost Per Impression (CPM) CPM or Cost Per Click (CPC) bidding when it comes to advertising on the display network. Opting for CPC bidding means that your adverts can be seen by thousands of potential customers but you only have to pay when someone actually clicks on the advert. 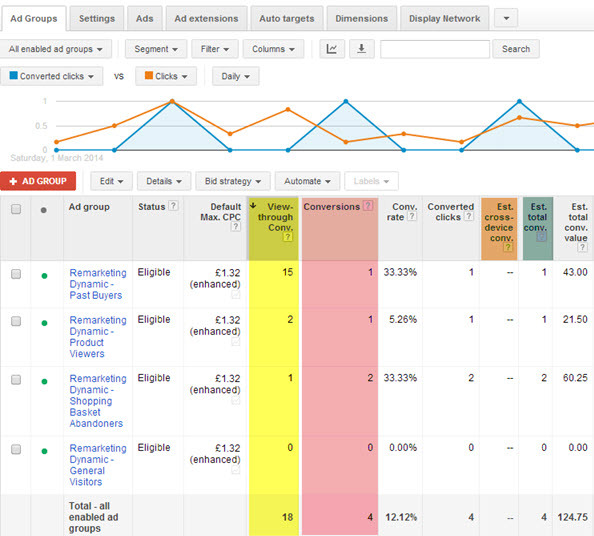 If you want to add more layers of targeting (placements, topics, gender, age, interests etc) you can add them to either your automatic or managed placement campaigns as bid adjustments (remember to change the setting to ‘bid only’ under the flexible reach tab in AdWords Editor if you want to have a bid adjustment on a criteria but still show ads when your other targeting criteria show). If you are doing display advertising through the Google Display Network, you should make sure you are using AdWords Conversion Tracking rather than importing your goals directly from Google Analytics. If you have this in place you can then track View Through Conversions making the data you get from your reports much more valuable. Display advertising may not always drive conversions directly from the adverts but the subliminal messaging from the adverts can enhance your brand profile and push people to convert with you along the way.